I thoroughly enjoyed watching The Gate again, it was a fun, rollercoaster ride, through the eyes of the three kids. They just don’t make ‘em like this anymore. Vestron Video strikes again! 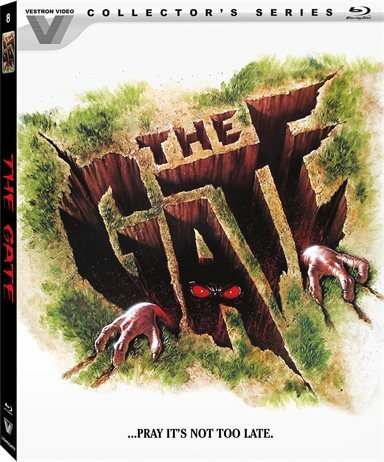 Hot on the heels of Parents and Lair of the White Worm, comes the oft-overlooked but always a ton of fun, The Gate. The Gate is directed by Tibor Takács (The Gate 2, I, Madman) and stars Stephen Dorff (Blade, The Immortals) in his film debut. A tree is removed from the backyard of siblings Glen (Dorf) and Al (Christa Denton), and the seemingly normal hole is, in actuality, a Gateway to Hell. A horde of demons (The Original Minions) is accidentally summoned through the Gate and it's up to Glen and his best friend, Terry (Louis Tripp) with the help of a Heavy Metal record known as "The Dark Book", to close the Gate before the world is overrun by the Hellish Hordes. The movie boasts plenty of creepy scenes, from a Zombie handyman, and the hordes of the aforementioned minions, which are mini versions of the Big Daddy Demon. These demons bite and drag and attack their way through the home, attempting to pull the kids into Hell. Eventually, they succeed and only Glen is left to attempt to destroy the Demon Lord. Using a model rocket his sister bought for him, "a symbol of love, light, and purity", he manages to fire it into the Demon, destroying it, thus preventing the Old Gods from returning. At the end, Glen is rewarded for his bravery as Al and Terry and even the dog Angus are returned safely, from the claws of Hell. Their only remaining trouble is how to explain the destroyed home to Mom and Dad when they get back from their trip. The Lost Boys, Prince of Darkness, Near Dark, Hellraiser, Evil Dead 2, Creepshow 2, A Nightmare on Elm Street 3, even The Monster Squad, to name just a few, were all released this year. It comes as no surprise that The Gate gets lost in the buzz, but in spite of all the iconic movies that year, it manages to keep its loyal fan base (I personally have many friends that LOVE this movie and for some, it was their gateway drug into the world of horror). The resurrected Vestron Video under the auspices of Lionsgate has done a great service for genre fans as they continue to release some great movies and they are doing them justice, like this one, with a solid 1080p High-Def transfer, 16x9 Widescreen 1.85:1 Presentation and 2.0 Stereo Audio, it hasn't looked or sounded this good since its release 30 years ago! It also comes complete with enough extras to satisfy the rabid fans, including commentaries with the Director and Writer and F/X Designer, among others, as well as featurettes and extras. Particularly fun was the Minion Maker featurette, where they discuss the use of forced perspective to film the creatures. I always thought the little buggers were animated and, as it turns out, they were actually people in rubber suits. It was a really interesting revelation, after all these years, and rather than ruining the ‘movie magic" it really gave me a renewed appreciation for what they accomplished on such a modest budget. For more information about The Gate visit the FlickDirect Movie Database.